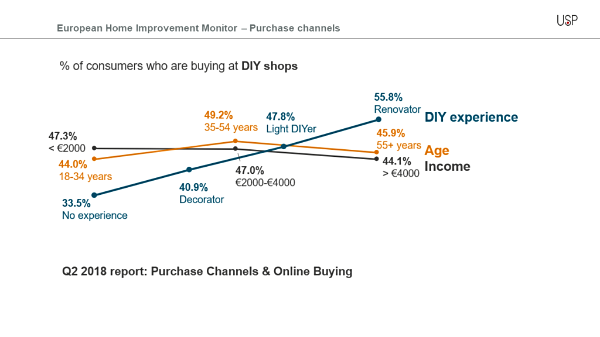 New report reveals the buying behaviour of consumers purchasing home improvement products has changed drastically over the last decade and suggests retailers should be targeting consumers in the 34-55 year age bracket, who have a low-to-medium income and have some level of DIY experience. USP Marketing Consulting’s European Home Improvement Monitor has tracked the changes in these channels across 11 countries and explains that the model has shifted from a traditional three- step sales approach (manufacturer- DIY store/speciality store- consumer) to a truly omni-channel one. Its latest Purchase Channels Report (Q2 2018) examined what effect parameters like age, income and DIY experience have on buying behaviour – with the latter ranking as the biggest influencer. Within the report consumers were categorised as ‘renovators’, ‘light DIYers’, ‘decorators’ and those with ‘no DIY experience’. Findings revealed that the level of DIY experience has the strongest influence on the share of consumers buying from DIY stores. Renovators are clearly the ones who visit the DIY store the most (55.8%), said USP, followed the light DIYer (47.8%), the decorator (40.9%) and the ‘no DIY experience’ group (33.5%). 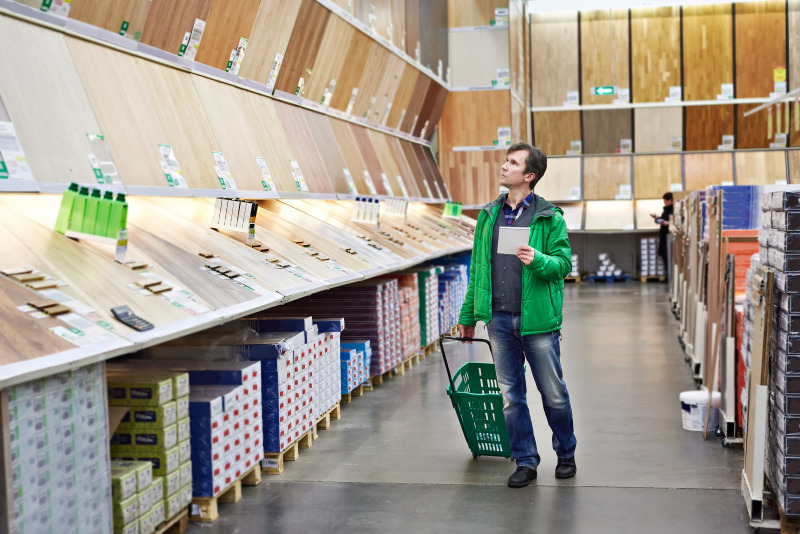 USP noted that the decorators have been actively targeted by DIY stores in particular lately but added that they, still, together with the group no DIY experience, are the group with the lowest percentage of consumers buying from DIY stores. Although it was found that the income of a European consumer has less influence, there is some correlation, as it was revealed that the higher the income becomes, the less likely the consumer is to shop at a DIY store. “This is, of course, logical because they outsource more and visit the speciality stores more often”, explained USP. As the level of income decreases, it is then more likely that the consumer needs to do the job themselves and is looking for cheaper and often private-label products. The graph below demonstrates the effect these parameters have and the percentage that buy at a DIY store (on a European level). Age also has an influence, with the youngest age group (18-34) least likely to buy at a DIY store, according to the report. “This is also easily explained, as a large part of this age group haven’t conducted any DIY jobs at all”, said USP. The European Home Improvement Monitor tracks key developments in the European home improvement market, including purchase behaviour, orientation, DIY vs DIFM, providing information on both general and product levels. The research is based on 26,400 interviews with consumers across 11 countries: Austria, Belgium, Denmark, France, Germany, Italy, The Netherlands, Poland, Spain, Sweden and the United Kingdom.